In a recent post at Signal vs Noise, Jason Fried argued that the Drudge Report is on of the best designed sites on the internet. I’m inclined to agree, not because it’s an amazing layout or well-coded, but because it’s iconic. His post made me a remember a parody of the site that I worked on around the time of the 2004 presidential election. For those that don’t know, I used to work for a humour newspaper in university, called Golden Words (whose website appears to be non-functional). The newspaper is widely read, with a circulation of about 9000 copies every Wednesday morning, and could be roughly equated to The Onion or the Harvard Lampoon. After a turn at the helm as editor in my final year, I returned periodically to make sure things were sailing along smoothly. Around the time of the US elections in 2004, I stopped by to see if the new crew could use some help. I was tasked with creating something for the back page, which was typically full colour and devoted to some sort of graphical mayhem or illustrated comic. 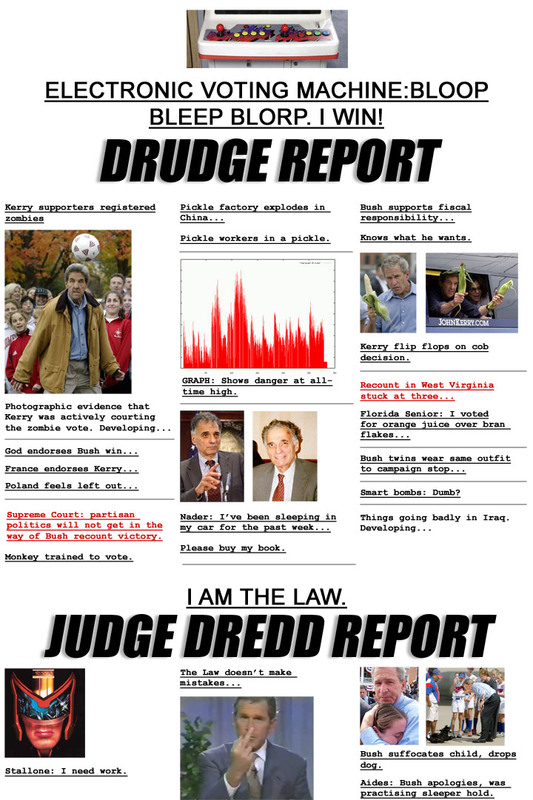 The Drudge Report’s iconic layout, and room for small photos and one-liners provided the framework for a quick and dirty send-up of the site. If I remember correctly, Alanah and I spent about two or three hours producing this parody of the Drudge Report for the 2004 Presedential election. It appeared on the back page of the paper around Hallowe’en, hence the zombie references. The line about Bush supporting fiscal responsibility is oddly prescient.